I promise to refrain from expressing wisecracks and torturous cat o' nine tales about the Guild of Women Binders and trade unionism for dominatrixes. And you? Do we have a deal? Okay. WALTON, Izaak. The Complete Angler. Binding by Miss Baly, c. 1900, for the Guild of Women Binders. patterns with the work carried out by Miss Heinrich.Image courtesy of State Library of South Australia. The Guild of Women Binders was founded by Frank Karslake (who also founded The Hampstead Bindery) in 1898. It operated until 1904 as a loosely-knit federation of women binders from such groups as the Edinburgh Social Union, the Kirkby Lonsdale Handicraft Class, the Chiswick Art Workers' Guild, and Miss Bassett's Leighton Buzzard Handicraft Class for crippled girls, among others. Some of the more outstanding women binders represented by the Guild included Miss Constance Karslake, Miss Edith de Rheims, Florence de Rheims, Miss Helen Schofield, Mrs. Frances Knight, Mrs. Annie Macdonald, Miss Mary Downing, Miss Heinrich, Miss Baly, Miss Hélène Cox, Miss Lilian Overton, Miss Gaskell and Miss Edwards. 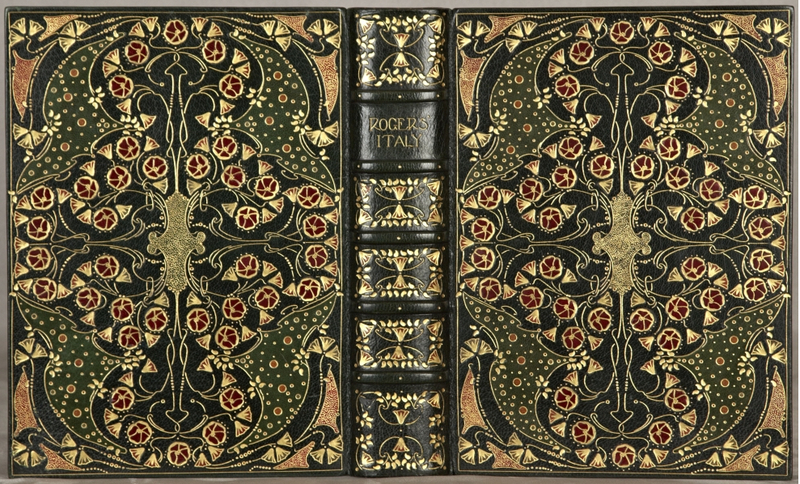 The Guild, together with its counterpart, The Hampstead Bindery, published The Bookbindings of To-morrow in 1902, and held both exhibitions and sales of their bindings at Sotheby's. 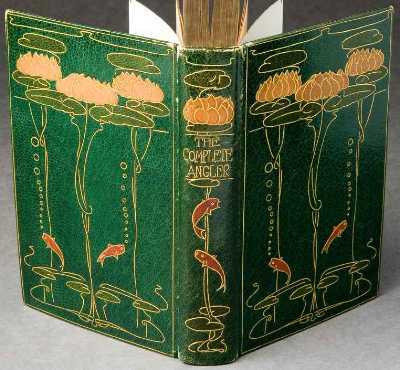 "Because the women were generally unaware of the long history of traditional bookbinding design, they produced designs that were freer and less stereotyped than those of men in the trade" (Tidcombe, Marianne. Women Bookbinders 1880-1920). ROGERS, Samuel. Italy, A Poem. for the Guild of Women Binders. This very striking, dark green morocco binding with extraordinarily elaborate gilt and inlaid decoration is an exuberant riot of decoration. Its covers feature an exceptionally animated and complex design with a central stippled cruciform radiating a controlled melee of gilt tooling and more than 600 inlays of red, moss green, gray, and ochre morocco forming flowering vines and geometrical shapes. Raised bands, compartments decorated with six inlaid flowers and multiple teardrop tools, and a compartment with gilt titling highlight the spine. Azure morocco doublures with attractive Art Nouveau frames featuring delicate gilt tooling and inlaid dark green sidepieces, light green cornerpieces, and orange dot accents grace the inside covers. Vellum endleaves with tiny gilt heart at each corner, and all edges gilt complete the binding. 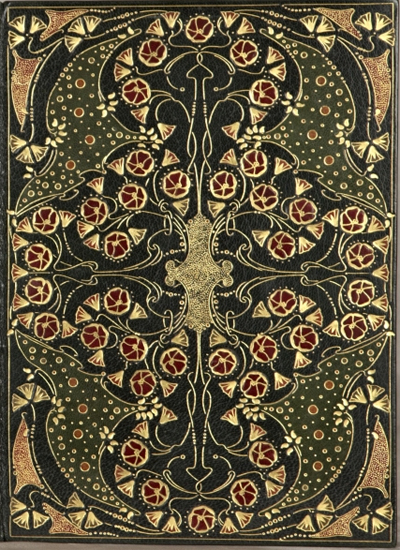 An effervescently ornate binding that is both historically important and absolutely spectacular, a previous owner's notes at the front indicate that this volume was sold by Sotheby's in 1904 (as part of the liquidation of Guild bindings after the group was officially disbanded) and later sold by the same auction house on 28 May 1923 as part of the library of I. A. Graham, Esq. of Carfin, Carluke, Lanarkshire. The annotator was the purchaser at that sale, paying the considerable sum of £5, 10 shillings. His notes also indicate that the binding was executed by Hélène Cox, mentioned by Tidcombe as one of the women who did ornate inlaid bindings at the Guild workshop, starting in about 1900. This must surely be one of the most flamboyant Guild bindings ever produced. FIELD, Michael (pseud. of Katherine Harris Bradley and Edith Emma Cooper). Stephania: a Trialogue. London: Elkin Mathews and John Lane, 1892. 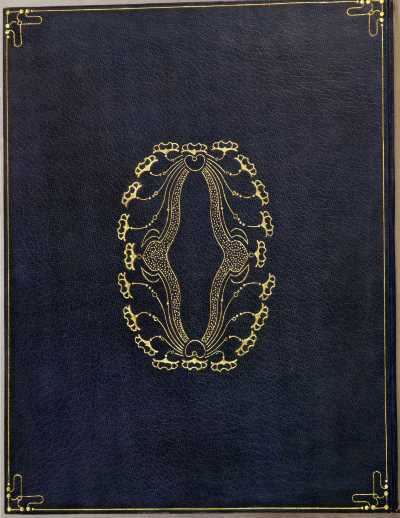 Bound by Annie MacDonald in 1898 for the Guild of Women Binders. 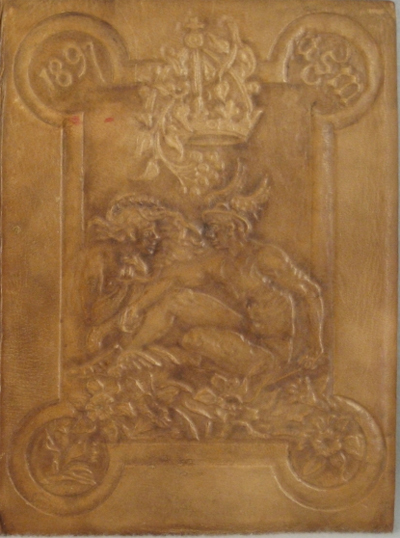 This exceptionally attractive modeled goatskin binding by Mrs. Annie MacDonald features a front cover with large lobed frame, its upper corners enclosing the binder's initial and the date (1897); the lower corners with daffodil blooms; the large central panel showing an elaborately detailed scene featuring a woman with long, flowing hair entreating the god Mercury in his signature winged hat and sandals, the two figures surmounted by an imperial crown through which twines a sprig of mistletoe (a design that appears in the woodcut frame on the title page). The lower cover shows the woman kneeling by a man reclining on a couch, this scene enclosed in an oval beaded frame. A modeled title flanked by pine cone device at head and tail decorates the spine. Green moire silk pastedowns framed by unusual turn-ins decorated with gilt vines and calf circles painted green and blue finish the inside covers. Leather hinges and top edge gilt finish the binding. The style of modeled leather seen here originated in Edinburgh with Mrs. Annie MacDonald (d. 1924), whose own work and that of her pupils played an important role in the history of British bookbinding, especially among women. Inspired by Medieval books, she began teaching herself and others in the early 1890s (in a group that became known as the Edinburgh Arts and Crafts Club) the special technique of modeling seen on this volume. MacDonald used undressed goatskin, which mellows with age from white to a rich amber color, and worked it with one small tool, without cutting, raising, or padding the leather. Tidcombe gives MacDonald the credit for inspiring the bookseller Frank Karslake to establish the Guild of Women Binders and says that "MacDonald was the prime mover in this, as she was eager to have a London outlet for bindings produced by her group... Their modeled goatskin bindings comprised 40 of the 114 bindings shown in the first Guild exhibition." The design of this binding is impressive in the precision and extent of detail seen in the modelling, and it is, as a whole, a fine, flamboyant, and prominently signed exemplar of MacDonald's work. for the] Guild of Women Binders, c. 1898. Binding by Constance Karslake (?) for the Guild of Women Binders. This superb, elegantly gilt dark clue morocco binding is graced by a tooled Art Nouveau design featuring a large central anthemium of flowers rising on a long stem from a stippled base. The cetral ornament is flanked by by three long-stemmed irises on either side. 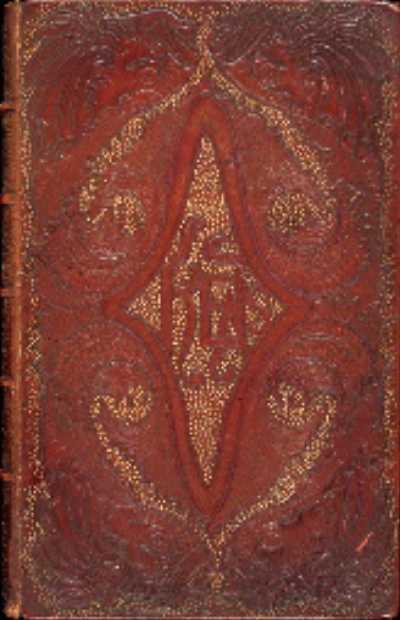 Vertical gilt titling, a single fillet, and small circles decorate the flat spine. Matching blue morocco doublures are tooled with an attractively complex central ornament encompassing considerable stippling and twenty large stylized flowers on curvilinear stems. Vellum free endleaves are ornamented with gilt hearts at the corners, and the top edge is gilt. 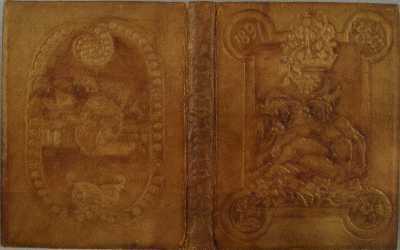 This binding is also "among the historically significant productions done by members of the Guild of Women Binders, a group of British female artisans responsible for distinctively innovative binding decoration during a kind of golden moment at the very end of the 19th century. Frank Karslake established the Guild in order to give an organizational identity to a group of women already at work binding books in various parts of Britain, often in their own homes. Karslake first became interested in women binders when he visited the Victorian Era Exhibition at Earl's Court in 1897, held to celebrate the Queen's Diamond Jubilee. He was impressed with a number of bookbindings at the Jubilee exhibit, prominent among them being those of Mrs. Annie MacDonald of Edinburgh, and he invited the women to exhibit their work in his shop at 61 Charing Cross Road. "The Guild was formed soon thereafter, when some of the women named Karslake as their agent. 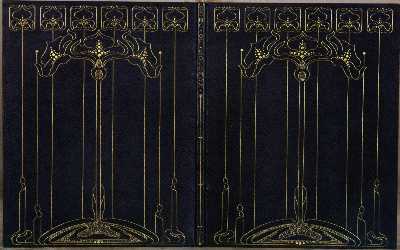 The binding here with its attenuated Art Nouveau feeling, is typical of the early work of the Guild, much of it designed by Karslake's eldest daughter Constance, the director of the Guild's workshop" (Cokie G. Anderson, Binding Women). This unsigned binding appears to be her work. Unsigned binding by the Guild of Women Binders, c. 1900-1904. Image courtesy of Bauman Rare Books. 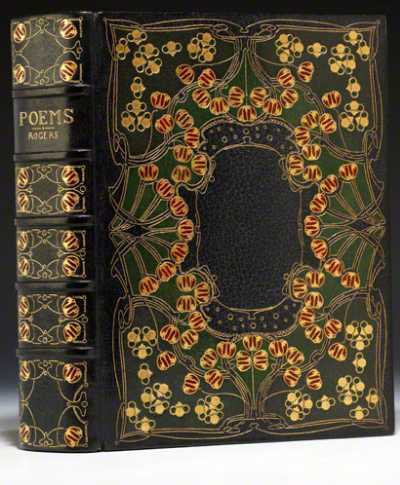 This stellar, early 20th-century full dark blue morocco binding has raised bands, an elaborately gilt-decorated and inlaid spine, wide cover borders gilt-tooled and inlaid in green and red floral motifs, and inlaid morocco doublures, vellum free endpapers, with all edges gilt. GRAY, Thomas. Elegy Written in a Country Churchyard. London: Printed for the Guild of Women Binders, 1899. 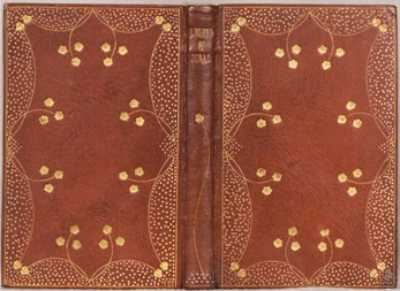 Binding unsigned, possibly by Constance Karslake.Image courtesy of Princeton University. 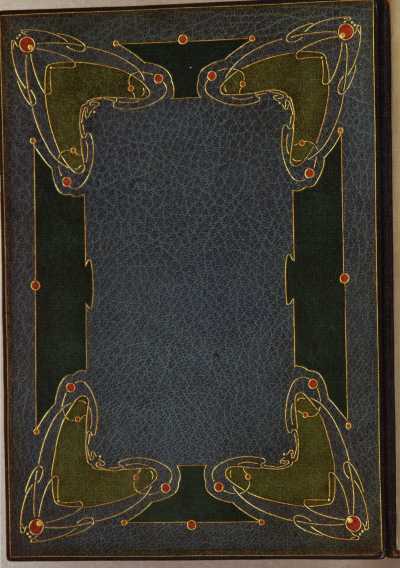 Full grain green goatskin with orange and citron inlays and gold tooling highlight this abstract Art Nouveau binding design. 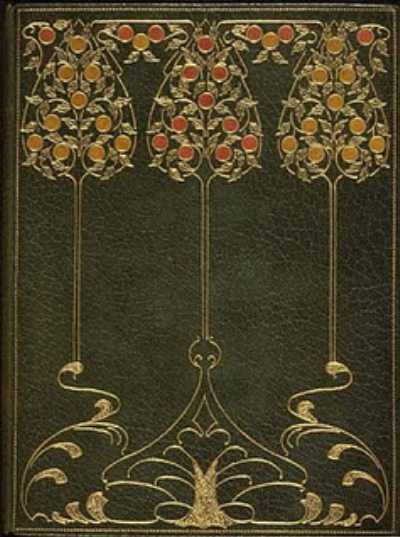 Contemporary binding by Mary Downing. This contemporary, heavily gilt morocco binding by Mary Downing features covers with a stylized design in relief of four fish forming large cornerpieces creating a central diamond with foliate decoration against a background of repeated pointillé dots, top edges gilt, others uncut. With binder's label stating "The cover of this Book was designed and worked by me Mary Downing" and front free endpaper stamped "Guild of Women Binders" It is No. 34 of 125 copies on Japanese vellum. Edinburgh: William Blackwood and Sons, 1897. Unsigned binding, likely by Constance Karslake. 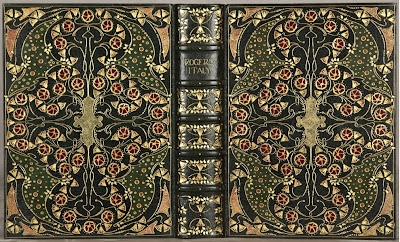 This binding for George Eliot's Jubal, with its attenuated Art Nouveau feeling, is typical of the early work of the Guild, much of it designed by Karslake's eldest daughter Constance, the director of the Guild's workshop (a pencilled note at the front here attributes the design of this volume to her, but we have not been able to verify that). “In an age largely given over to utilitarianism,” wrote Elliot Anstruther, “it is gratifying to find purposes and persons at variance with the conditions around them, and in no field is the discovery more productive of satisfaction than in that of industry. …The introduction of machinery has nearly lost to us the self-reliant, consciously-proud figure of the English craftsman; the old Trade Guilds, with their dignified constitutions and worthy aims, had little in common with their corporate successors of to-day, and the stress of competition has driven thousands of women and girls into the already overcrowded ranks of suppliant labour.” (Introduction, The Bindings of To-Morrow. A Record of the Work of the Guild of Women-Binders and of the Hampstead Bindery. London: [Griggs & son], 1902). I'll keep it simple and just second the previous two comments.